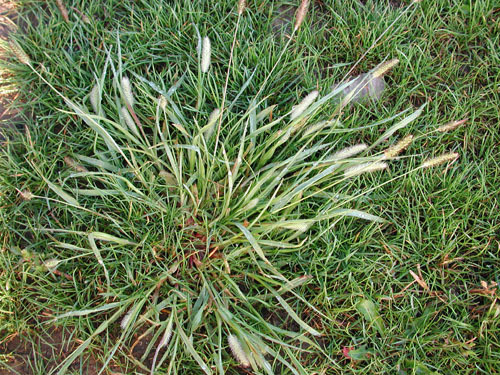 Learn more about some common lawn weeds and how to deal with them. Crabgrass is a warm season annual weed that invades lawns that are thin, weak and undernourished. It germinates from seed in late spring once soil temperatures have reached 50 F (10C). During the summer it develops into a ground-hugging weed that spreads over the surrounding grass. In late summer it produces hundreds of seeds that will sprout the following year. 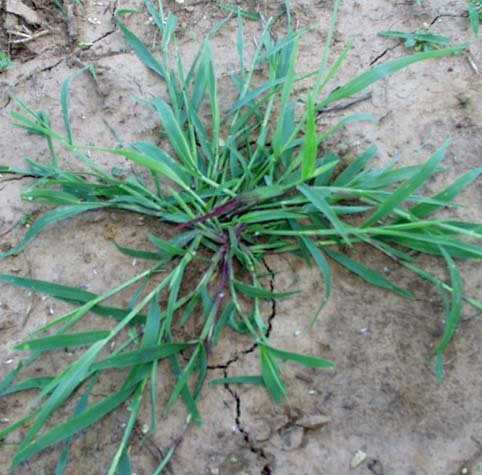 Crabgrass seeds can remain in the soil for many years and sprout when the soil is disturbed. The best defense is a good offense. Regular overseeding of your lawn will encourage a dense root system which will not provide space for Crabgrass to grow. Crabgrass is very rare in thick, healthy lawns that are mowed to a height of 3 inches (7.6 cm) this helps to keep the soil cooler thus inhibiting germination of Crabgrass seeds. If you have had Crabgrass in the past, in early spring give the area a hard raking to dethatch it and remove the debris. You can then apply corn meal gluten, which will act as an organic pre-emeregent herbicide. Please note that since corn meal gluten is a pre-emergent, you cannot overseed your lawn until the fall if you use corn meal gluten in spring. The best way to organically control Crabgrass is to ensure that you keep your lawn mowed in late summer when the Crabgrass is putting up its purple seed stalks. This will prevent it from making seed for the future. Non-organic Solution: Often, by the time Crabgrass is noticeable it is too late to treat, however there are chemical crabgrass treatments. Contact your local garden centre or hardware store for options in your area. Dandelions are the bane of many peoples lawns. Thriving in thin, sparse turf, dandelion seeds float through the air looking for the slightest opening in the lawn to propagate. Meanwhile, below ground, they develop a taproot up to 10" long. This taproot is thick but brittle and easily fractures and any piece of the taproot that remains in the ground will re-grow. Regular overseeding of your lawn will encourage a dense root system which will not provide space for Dandelions to grow. Leave grass clippings on the lawn as they act as mulch helping to prevent Dandelion seeds from germinating. That said, if you do have Dandelions there are very few organic options. If there are only a few of them, you can dig them out by hand, try to get as much of the root as possible. There is also a biological agent called "Sarritor" which is a fungus that selectively attacks dandelions and some other broad leafed weeds while not harming grass. Check with your local garden centre or hardware store to see if they stock it. 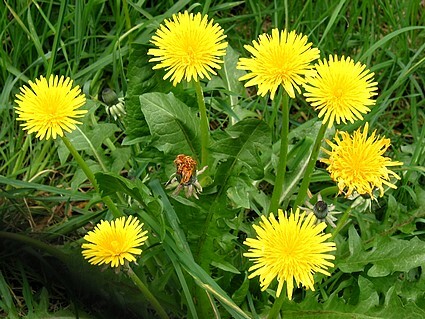 Another alternative is to pour boiling water on Dandelions as boiling water kills any and all plants. If you use boiling water you will need to re-seed the affected areas. Non-organic Solution: If you are using a broadleafed herbicide, use one where the active ingredient is 2-4-D. The ideal time to use herbicides on Dandelions is in early fall when the leaves are transferring nutrients down to the roots. Herbicide applied in early fall will be absorbed by the leaves and passed on down to the roots. Native to Europe, Quackgrass is easy to identify. It produces long, wide-leafed grass and the grass blades have a rough almost burr-like feel to them. The thick, white roots form deep, dense mats and these roots tend to break easily when pulled leaving pieces in the soil after the grass has been removed. Any pieces left in the ground will quickly re-grow into new plants. Again, the best defense is a good offense. Regular overseeding of your lawn will encourage a dense root system which will not provide space for Quackgrass to grow. Unfortunately, there are no organic products that are effective at eradicating Quackgrass. If the area affected is small, digging it up is a good option but be sure to get all of the roots. Frequent mowing is also an effective way to control this as mowing prevents Quackgrass from making seeds for the future. Be sure to keep the mowers blades set to a height of 3 inches. Another option to prevent Quackgrass from germinating is to apply Corn Meal Gluten in early spring as this acts as a pre-emergent herbicide. Please note that since corn meal gluten is a pre-emergent, you cannot overseed your lawn until the fall if you use corn meal gluten in spring. A further alternative is to pour boiling water on Quackgrass as boiling water kills any and all plants. If you use boiling water you will need to re-seed the affected areas. Non-organic Solution: Spot spay in early spring or early fall with a non-selective herbicide containing glysophate (Round Up). As this also kills turf, you will need re-seed the areas you have sprayed. 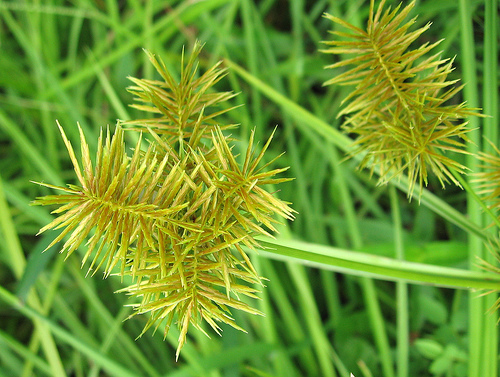 Also known as Nut Sedge, this wide-bladed bright green grass grows at warp speed. Each grass blade has a thick mid-vein and a waxy coating. It has a shallow root system that produce many nut-like tubers which are underground food storage for the plant. Each tuber has up to seven viable buds and each one can grow and produce new plants. Each new plant also produces rhizomes that create new plants. This is one weed that you should not try to pull out as this simply encourages the underground nutlets to generate new growth. If the area affected by Nut Grass is not too large you can dig it up but be sure to remove the entire plant including the nutlets. You likely will need to repeat this digging process about every 2 - 3 weeks during the summer. Nut Grass thrives in poor, compacted soil so enriching the soils with compost will help alleviate the conditions it prefers to grow in. While we have not tried this ourselves, Liquid Horticultural Molasses diluted at a rate of 1/4 to 1/2 cup per gallon of water and drenched over the Nut Grass apparently fires up the microbes in the soil causing the Nut Grass to simply fade away. It will take 2 - 3 applications for complete control. Non-organic Solution: Unlike most lawn weeds, Nut Grass does not respond to most broadleafed weed killers. However, if you have a serious Nut Grass problem the chemical Halosulfuron can be applied by a professional. Typically occurring in shady, damp acidic soils, moss spreads through spores. 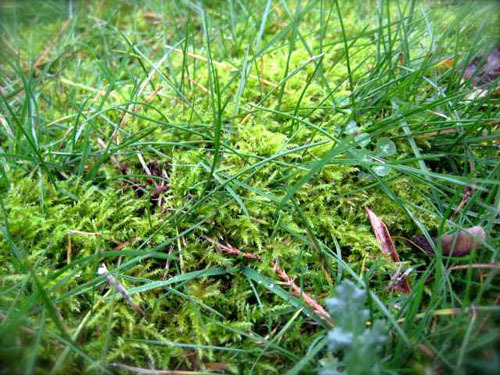 The best way to effectively and permanently eradicate moss in the lawn is to physically remove the moss. Start by raking the area with a hard rake to loosen it. Then using the edge of a flat shovel, scrape away the moss and remove the debris. Next, top dress the area with compost and to seed it with Eco-Lawn seed. Eco-Lawn is far more shade tolerant than most turfs and will out-compete moss growth. If the affected area has heavy or compacted soil, it is a good idea to loosen the soil to a depth of at least 3 inches and re-grade to allow drainage before sowing Eco-Lawn. You can also make a spray consisting of 4 ounces of dish soap to one gallon of water and drench the moss with the solution. The moss will turn orange/brown in 24 hours and will dry up. Non-organic Solution: There are a number of moss killing pesticides such as "Moss Out!" available. Contact your local garden centre or hardware store for options in your area. Bindweed is a vining plant that snakes across the ground. 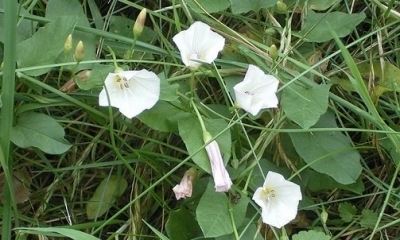 It has arrow shaped leaves and white/pink flowers that look like morning glories. Bindweed can grow four feet or more in length and develops deep roots. Vigilance and persistence are required to control Bindweed, where you see it, cut it off at the soil level. Don't try to pull it out as it will just re-sprout from its roots. By continually cutting it off at ground level as often as you can, will prevent the Bindweed from experiencing photosynthesis and thus it will eventually starve to death. Another alternative is to pour boiling water on Bindweed as boiling water kills all plants. If you use boiling water you will need to re-seed the affected areas. Non-organic Solution: Spot spay in early spring or early fall with a non-selective herbicide containing glysophate (Round Up). As this also kills turf, you will need to re-seed the areas you have sprayed. White Clover also known as Dutch Clover is a cool-season perennial that is native to Europe and Asia. Low growing, it forms creeping stems (stolons) that produce roots and shoots along its stem. Being in the legume family, it fixes nitrogen into the soil which enables it to thrive in unfertilized areas. There are very few organic controls for White Clover in the lawn. Corn Meal Gluten applied in early spring acts as a pre-emergent herbicide which will stop new White Clover seeds from germinating. Please note that since corn meal gluten is a pre-emergent, you cannot overseed your lawn until the fall if you use corn meal gluten in spring. If you must get rid of established clover in the lawn hand pulling is the only really effective way. Time your hand pulling to be after the lawn has received a good, long rainfall or water the lawn very deeply before trying to hand pull them. A very moist soil will make the hand pulling a lot easier. 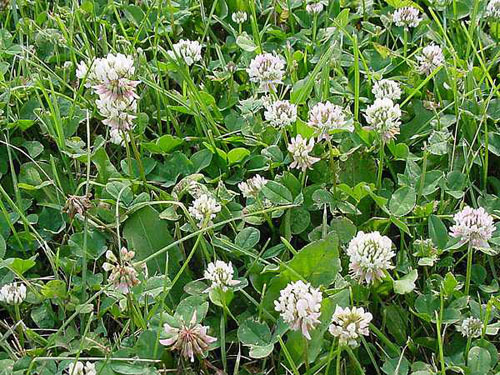 Non-organic Solution: Any commercial broadleafed weed killer will be effective on White Clover. Contact your local garden centre or hardware store for options in your area. This perennial weed is often found in neglected lawns. It has a vigorous creeping habit as it spreads with creeping stems that take root at intervals along its way. 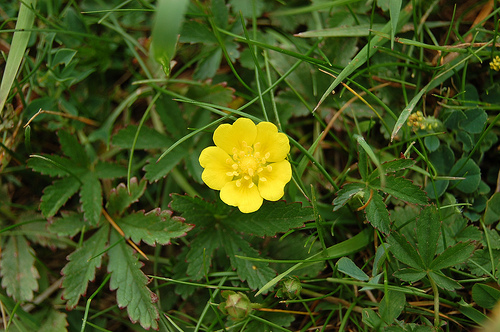 The leaves of Cinquefoil resemble those of wild strawberry with each leaf having five heavily toothed leaflets. It produces yellow flowers with five heart shaped petals. If there are not too many of them, hand weeding is effective. Raking the lawn prior to mowing will also help to weaken and discourage it. Non-organic Solution: Chemical controls will require repeated applications to totally eradicate Cinquefoil. Contact your local garden centre or hardware store for options in your area. 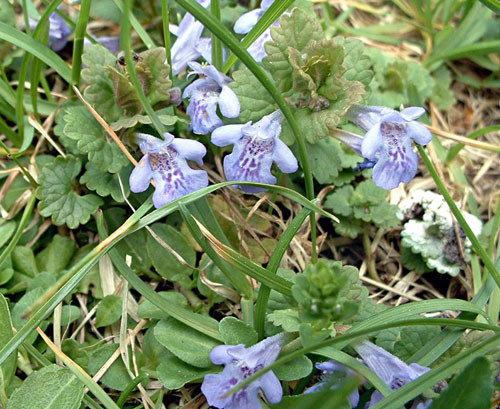 Creeping Charlie is a very aggressive lawn weed that is difficult to control when established in lawns. It has low growing, creeping stems that form new plants where they root at its nodes. The creeping, spreading, invasive nature of this weed, along with its preference for shady places makes it very competitive in lawns. Repeated physical removal of Creeping Charlie by pulling or hard raking will, over time, prevent the Creeping Charlie from experiencing photosynthesis and thus it will exhaust its stored energy supply. Research at Iowa State University found that borax can be used to selectively control Creeping Charlie in turf. To do so, dissolve 1 ounce of borax in 2-3 gallons of water and apply the solution uniformly over each 1,000 sq. ft. area. For small infestations dissolve 5 teaspoons of borax in one quart of water, this covers 25 sq. ft. Do not re-apply borax solutions more than once a year as borax contains boron, too much of which can be toxic to your lawn. Non-organic Solution: A broadleafed weed killer that contains a combination of 2-4-D, dicamba and MCPP/MCPA will be effective. Contact your local garden centre or hardware store for options in your area. Broadleaf plantain is a perennial weed that tolerates a wide variety of growing conditions such as, dry soil, wet soil, heavy clay soil and low mowing heights. 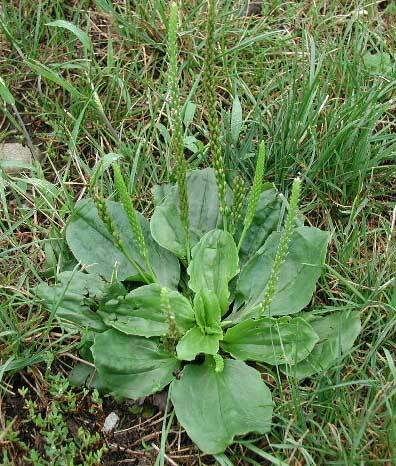 Left undisturbed, plantain can grow as much as 12 inches across and 2 feet tall. If there are not too many of them, hand weeding is effective. Try to remove as much of the root system as possible. You may need to moisten the soil before trying to pull it out as it does make a deep tap root. Note: you may need to repeat this throughout the summer. Non-organic Solution: Spot spay in early spring or early fall with a non-selective herbicide containing glyphosate (Round Up). As this also kills turf, you will need to re-seed the area. Our customer service centre and technical support team is available Monday - Friday 8 am - 4 pm Eastern Time.